I like to try out different types of dal recipes especially from regional Indian cuisines. 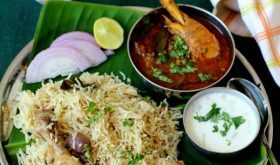 There are numerous easy to cook recipes that we are not aware of and I try to unearth a few culinary gems and add them to my repertoire. One such classic is Gujarati dal recipe that is a super hit at home. 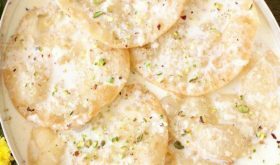 Most Gujarati food recipes call for the addition of jaggery or sugar and you will find a hint of sweetness in their everyday meals. I love Gujarati vegetarian food especially the dhokla, everyday shaak (subji/kuralu) and dal. Wash tur dal, add one cup water to the dal and pressure cook upto 4 whistles. Once the pressure eases, transfer the dal to a deep vessel and mash it with a masher. To the mashed dal, add 3 cups of water, raw peanuts, turmeric powder, red chili powder, minced ginger, green chilies, chopped tomatoes, jaggery and salt to taste and simmer for 12-15 mts on low medium flame. Keep stirring in between. Heat oil or ghee in a small pan. Once the oil is hot, add mustard seeds and allow to splutter. Add cumin seeds, fenugreek seeds, red chilis, bay leaf, cinnamon stick. asafoetida and curry leaves and saute for a few seconds till the fenugreek seeds turns red and the cumin turns brown. Turn off flame. Remove to a serving bowl and garnish with coriander leaves. Serve with roti or rice. Dried dates are also used to sweeten the dal in place of jaggery. You can add 1/2 tsp of cumin-coriander powder. 2 cloves and a star anise can be added at the time of tempering. Do not cook the dal after adding the lemon juice. If adding tamarind paste or kokum, add them after the dal simmers for 5 mts. Ensure the dal is completely mashed before proceeding to prepare the dal. Add enough water to the mashed dal. This is not a thick dal but slightly thinner in consistency. For a tangy flavor, add more lemon juice and adjust jaggery according to your preference. 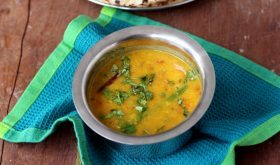 There are a few other versions where 2 to 3 types of dal like chana dal and split green gram are also added along with tuvar dal. By Sailu Published: November 4, 2013 Gujarati Dal recipe is easy to make, vegetarian & a gem among Gujarati dishes recipes. Out of various dal recipes I am very fond of Gujarati style tur dal. Sounds delicious. Bookmarking to try! 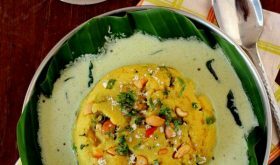 Can you advise how to cook the fur dal without a pressure cooker please? You can soak it in twice the amount of water for about an hour. Then pour into the saucepan and cook for an hour. Pressure cooker take 15 minutes, that’s why it’s convenient. The dal tastes superb. Love this recipe. Too good. Tried this today and it’s absolutely yummy! 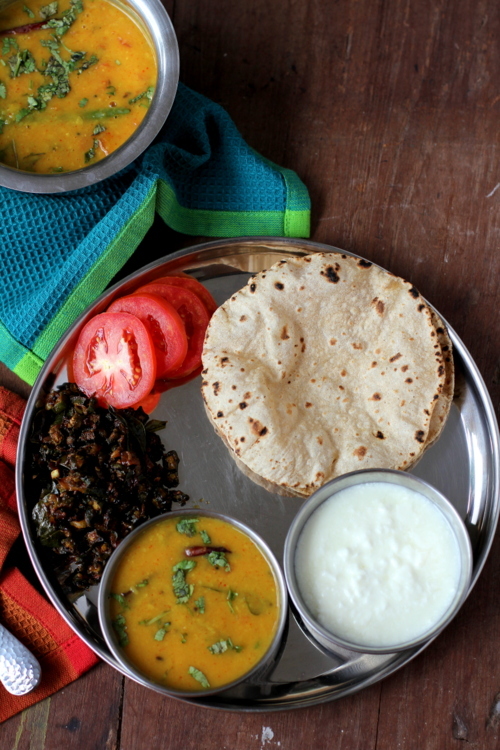 Very authentic too – reminds me of all the times I’ve had Gujrati dal in restaurants!